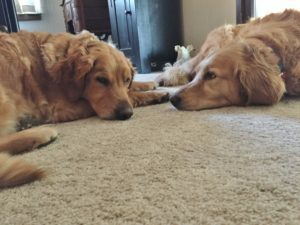 June 2017 – Gracie (L) with her BFF Max (R), also adopted from GoldHeart are BFFs, and have told Mom, we need to stay together! Wish granted! 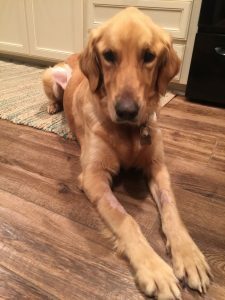 Thanks to all the love in her foster home, Gracie is doing great and was just spayed and is ready to soon call her foster home her forever home. Congrats Gracie! Gracie continues to improve slowly. She has gone from 39 lbs to 62 lbs since coming into GoldHeart. Her red blood cell count is at 36…low normal is 35 and her platelets are 171…low normal is 170, but they were zero for a long time. We will take — low normal is a Christmas miracle for this gorgeous girl. The vet did decrease her prednisone from 2/day to 1/day…yay! But you would never know it, she’s very active, and definitely queen of the house. I had to buy a barrier system which is a collar that beeps when she sticks her head thru the cat door to venture into the basement. It doesn’t hurt her but deters her…at least do far. If there is any dog that can figure out a way to outsmart a human or device, it will be Gracie! She also still needs to be spayed, but we’re still a few months away from that. It’s a miraculous turn-around for Gracie and big thanks to her awesome Foster Mom from all you fans at GoldHeart! All the pictures except the last one, which was taken shortly after arrival, are recent – WOW what a difference! September 16 Bio — Welcome to gentle Gracie! 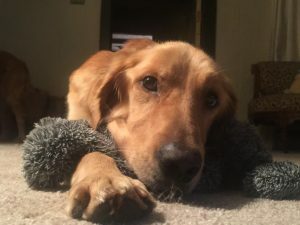 Her GoldHeart foster mom reports she is just too sweet for words and she plans to do whatever it takes to help her adjust and heal…not to mention, shower her with love! What a lucky girl she is! Gracie is about 5 years old and will need to be spayed, but before that, she has several health issues that need to be addressed. 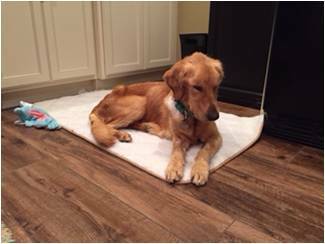 Please send positive thoughts for her as she recovers in her loving foster home. Gracie is an international rescue and we were told she was used for breeding, until taken in by an awesome caregiver there. 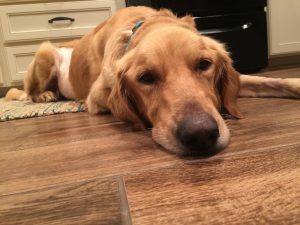 In turn, Gracie’s caregiver connected with GoldHeart to see if we could help get this gal to the USA and the good life she so deserves. She made the journey to the USA after initial vetting in Egypt and landed at JFK on the 13th with four other golden GoldHeart rescues. 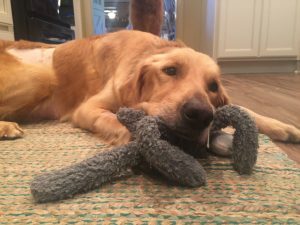 Update 10-3-2016 — Gracie is now back at her loving foster home, and is finally doing better, she will continue under the care of the good Doctors at University of Penn for the multiple tick-borne diseases and we are hopeful she will continue to get better. Breaks our hearts after she had started feeling better before a second hospitalization and was enjoying her first roll in the grass (see video below). Please send positive healing thoughts her way.